Quick & Easy way to plan your Bachelor Party! With our “Make Your Day” package you can easily choose a daytime activity and nighttime activity for your Bachelor Party / Stag Do. 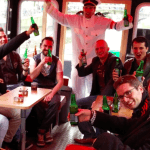 We offer this unique Bachelor Party Package for € 42,50 per person. So for this great price you will have 2 activities in Amsterdam during the day and evening. At the bottom of this page we have shortly described the activities. You can tell us your preferred time for the activities and we will do our best to arrange it at that time or else we will make sure it is as close as possible to your preferred time! The mimimum amount of persons for the “Make Your Day” package is 10 persons. 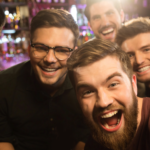 We specially put together this Bachelor Party Package for people on a budget or those who want to save more money for beers! 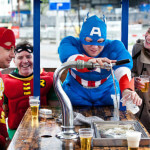 Next you can quickly & easily fill in the form and you are ready to go for a great Bachelor Party / Stag Do in Amsterdam! Only € 42,50 per person! Next you will have some short descriptions about the activities in this bachelor party package. Same as paintball, but with Bow & Arrows! 1,5 hour game to play in the outdoor garden area of the former Amsterdam “Bijlmerbajes” Prison. 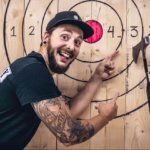 1 Hour of Axe throwing at the coolest location in town! The former Amsterdam “Bijlmerbajes Prison”. Your instuctor will teach you how to throw the Axe and set up a tournament for you. Play Indoor 5-a-side Football with your friends for 1 hour. Court rent, football, bibs, referee, all is included. Play 18 holes of Foofgolf on your Bachelor Party. Fun & sportive activity! Get the Bachelor / Stag handcuffed to the Smurfette and she will guide him and your party through the Red Light District for 1,5 hours. And you will have a free shot to start the Smurfette Pub crawl. Have a great professional Striptease Show especially for the Bachelor/Stag! You can choose to have the striptease at your accommodation or whatever location you prefer. We can also arrange it at a bar in city center for you. Feel free to contact us via our contact form when you have any questions about this Bachelor Party Package! Or you can call us on +31207372619.